Here's the Dokkiri Hand Case for iPhone 4. And yes, even the place that sells it is creeped out. The sales pitch over at Strapya World reads: "Why??? Yeah, I am asking myself the same thing. Why would you want a hand on your iPhone 4, right? 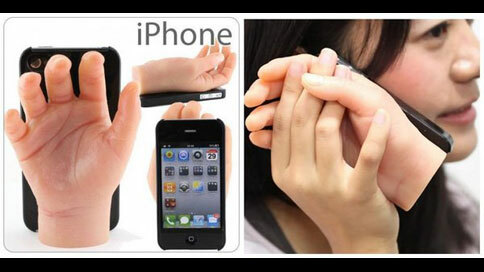 Well, believe it or not, this Hand iPhone 4 case could actually come in 'handy.' As shown on the picture on the right, you could hold hands with your iPhone to make sure you don't drop it. Or if you are feeling really lonely, this case may reach out to you and give you company. Okay, I am done. This case is crazy. This case is creepy. And for some people, this case is absolutely awesome." It will cost you $64.20, plus shipping, plus the last vestiges of your sanity.